This rather large statue caught my attention on my way to Footscray by train a few months back. My age did not dither the curious little guy still hide somewhere in my mind, forcing me to visit the location in search of few unanswered questions. After all, who is this imposing figure and why is she standing there alone near the Maribyrnong River? My first conclusion was; it is the statue of the Goddess of Mercy, which usually found in Buddhist temples. But I was wrong. 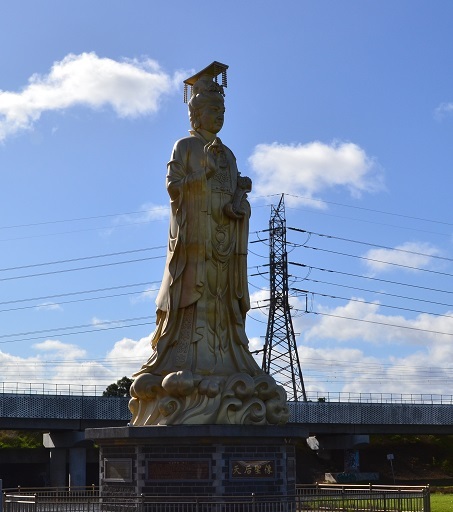 It is the statue of Heavenly Queen, also known as Mazu. This stainless steel, gold painted statue was designed and made in Nanjing, China. Mazu is a patron of the seas so newly arrived immigrants from China often erected temples to her as a thanks giving for safe travel to their new destination. The priests or the temple keepers at the temple, could not help me with much information about the temple as I could not understand Chinese and they were not as proficient in English. My nimble fingers and Google compensated for the deficiency. Goddess Mazu was born in Meizhou , Fujian Province in China in the year AD960 in the family of fishermen. She was the seventh daughter of her parents. She did not cry, when she was born so she was given the name, Moniang, which means silent girl. In her teens she became an excellent swimmer and used to guide fishing boats home even in the harshest weather. Her life of miracles began when she saved her father and brothers from a typhoon with her divine power. But one of her brothers drowned in the incident as her mother woke her up from her trance state. There are two versions of her death. In one, she died at the age of 28, when she climbed a mountain alone and flew to heaven and became a Goddess. In another version she died at the age of 16, of exhaustion after swimming far into the ocean trying to find her lost father and her corpse later washed ashore. During her life time, she preferred to wear red dress, so after her death, it is believed that she forever roam over the seas to save those in distress in her red robes. 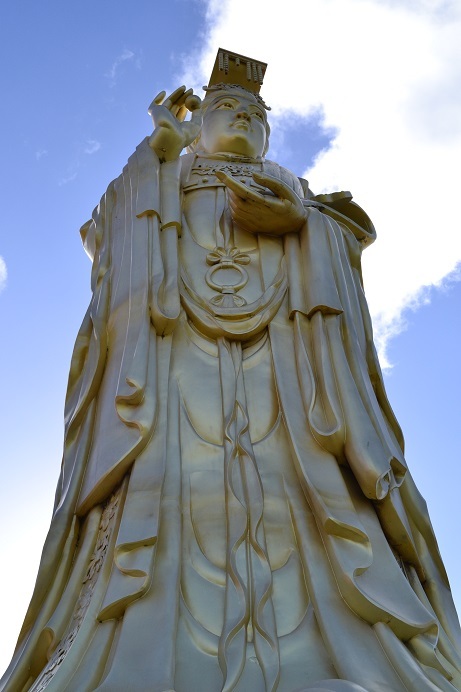 But there is a distinct connection between Goddess of Mercy – Guanyin and Mazu. Over time, religious beliefs of Taoism and Buddhism started to overlap each other. Both the religions adopted deities from each other in an effort to attract devotees to their temples. The legend says that Mazu’s parents prayed to Guanyin for a son, but Guanyin instead of giving them a son, reincarnated as their daughter. Some Buddhists consider Mazu as a one of Guanyin’s many manifestations. 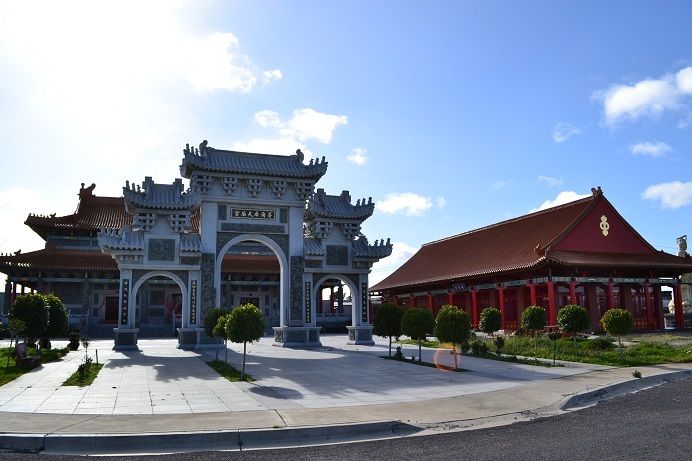 The temple is still in the construction mode, spanning around 40000 square metres in area. Once completed, it will house a tea house and restaurant that can seat up to 1000 people and a Chinese Garden. 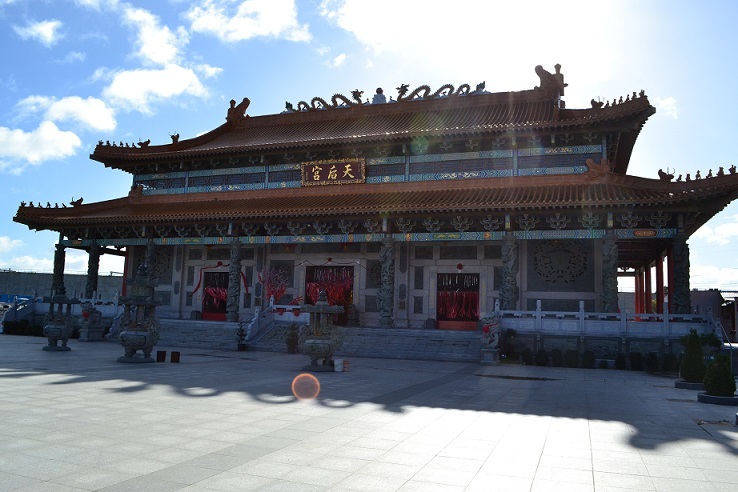 This is a must visit location for those interested in Chinese culture and architecture. What the hell is Sa Re Ga Ma Pa Dha Ni?